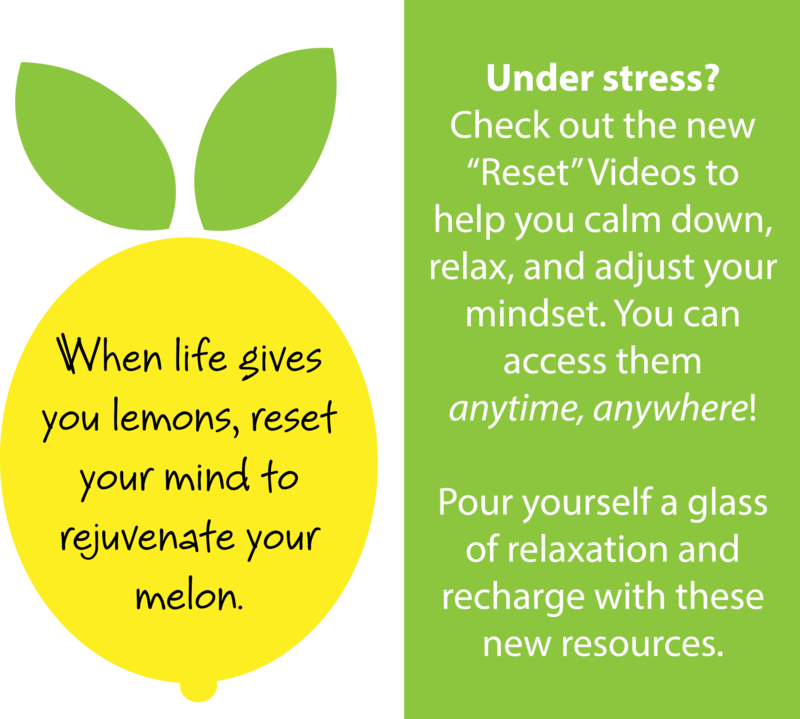 When life gives you lemons, reset your mind to rejuvenate your melon. Do you ever just need to calm down? In a whirlwind of expectations, with deadlines and schedules, sometimes, things don’t work out the way you expect. Perhaps you envision how your day is supposed to go—play a video in your mind. Reality sinks in, and you discover that how you planned out your day, didn’t happen at all. Everything falls apart. It’s a disaster. There’s one factor that many of us forget to account for: life. It may seem like life’s challenges are setbacks, but, what if it was really giving you lemons? You may not have control over frustrating situations, but you do have the control to change your focus. Empower yourself to take charge of your day. The Dan Abraham Healthy Living Center created tools to help you regroup—reset. Reenergize your mind by experiencing the Reset Videos. These quick videos can rejuvenate your mind and help you start over, anytime, anywhere. Unwind with the seated Alexander Technique, or let the serenity of the Loving Kindness Meditation encapsulate your attention. There are a variety of modalities that you can practice in solitude or with a group. No matter where your path leads you, just remember that when life gives you lemons, reset your mind to rejuvenate your melon. Pour yourself a glass of relaxation and recharge with these new resources.